We sat on the Japan side, listening to chanting and loud drums. On the Iraq side, they were playing Iraqi music with flutes. The world just got a little smaller here in Qatar. Soccer or football, whatever you want to call the sport on your side of the world, is in full play here in Doha, Qatar for the AFCU-23 Championships (Asian Football Competition with Men under the age of 23). Four stadiums are being utilized for the playoffs. The spacious, stunning venues are all in preparation for the World Cup here in Qatar in 2022, and this week we all got a taste of what is to come in six more years. Sixteen continental teams competed in the championships, with three being able to go to the 2016 Olympics in Rio de Janeiro. So far Japan and Korea are on the docket to go to Brazil, with Qatar and Iraq playing tomorrow for the third slot. Qatar, the host country of the championships, is aspiring to clinch the third slot to go to Rio. In my opinion, the best part about living in Doha is the exposure to almost every country of the world here. Sports bring a group of diverse people that normally would never meet. The Paralympics 2015 Championships here in Doha a few months ago created the same unifying feeling. With the AFC Championships in Doha this week, there were encounters and introductions with the fans and athletes from sixteen Asian countries: Qatar, Iraq, Jordan, Saudi Arabia, UAE, Syria, Australia, North Korea, South Korea, Japan, China, Thailand, Iran, Vietnam, Yemen, and Uzbekistan. Unlikely friendships unite and collaborate on the field and in the stadium. "I believe that appreciation is a holy thing--that when we look for what's best in a person we happen to be with at the moment, we're doing what God does all the time. So in loving and appreciating our neighbor, we're participating in something sacred." 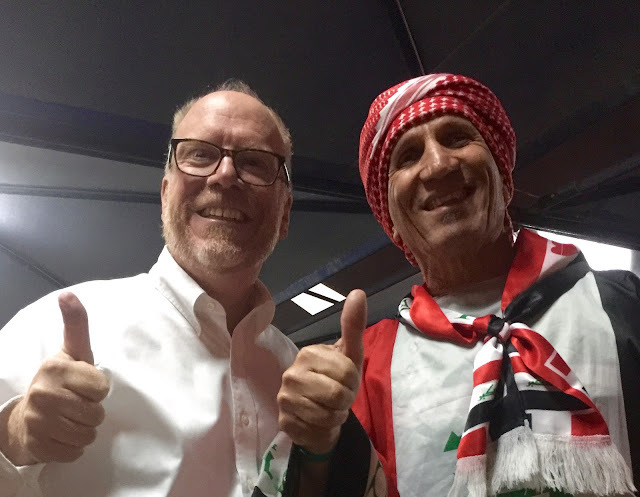 To meet people here from Yemen, Iraq, and other unfamiliar places is opening my eyes, and that is a spiritual experience in a soccer stadium. At half time, the screen on the other side of the field read "Prayer Time." --giving time to those Muslim fans and athletes to take the time to pray. This is one of the fabulous parts of living in Qatar--to be more familiar how people all over the world live their lives. They might have been in the middle of a soccer game, but "prayer time" did not disappear. Two football fans, rooting for everyone, my husband from the US, and an Iraqi fan. I love the way sports can bring people together--all under the same sky in a stadium. i could not resist talking to this Iraqi man who was so interested to talk to me too. He wanted to teach me all about the origins of his hat. This is the picture of the remaining 9th century minaret that is called the Mosque of Samarra he was trying to tell me about. 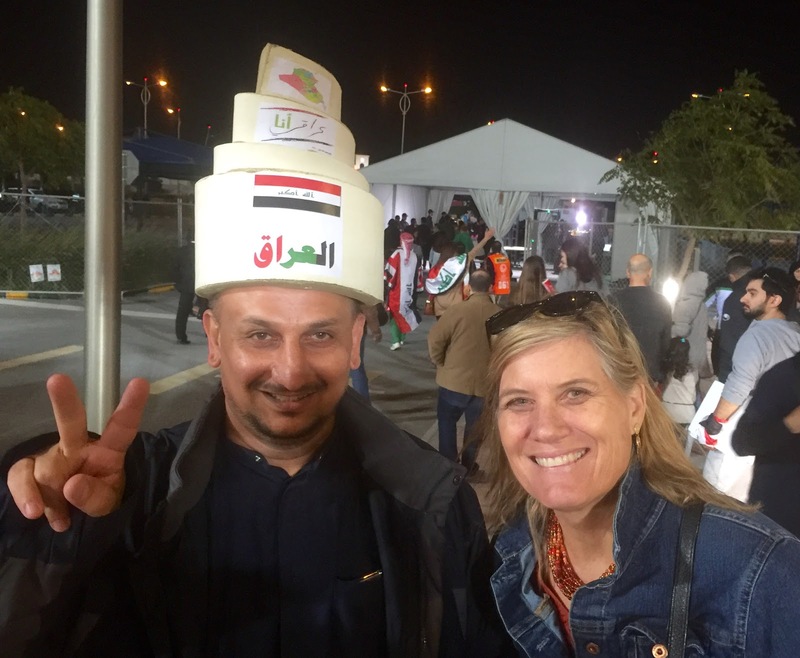 A woman I met in the parking lot wanted to talk to me with her "I love Iraq" hat on. 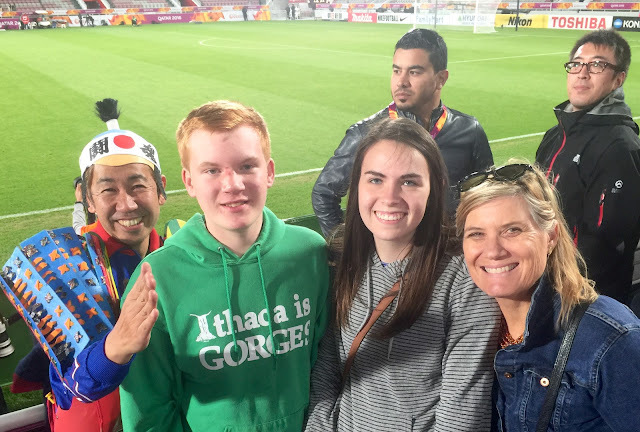 A kind Japanese man who was calling out the chants and songs in the game posed with us. I was surprised at how many Japanese people live in Qatar or came for the game. Some Japanese fans, in traditional dress. 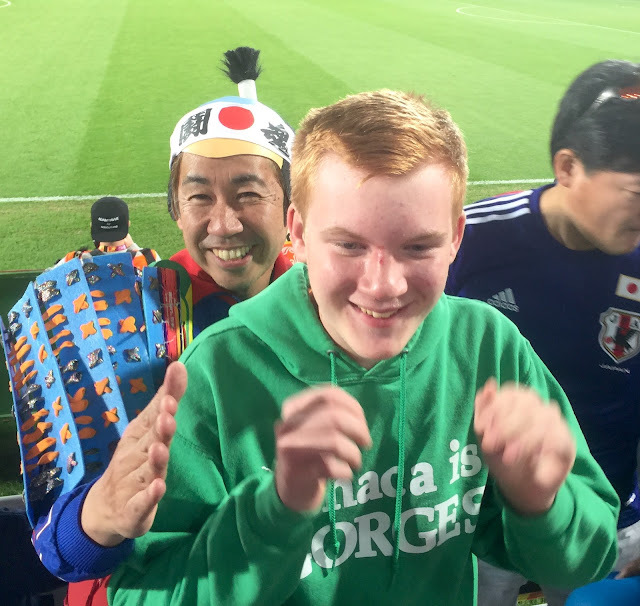 Many of the Japanese fans were there to see Kubo Yuya, their rising star in football. He did not disappoint, and made the first goal of the game. AIFF standard secretary Kushal Das said that the deals will be looked at null and void if AIFF doesn't get a duplicate within weekly. "The Players Position Committee suggested that every time a contract is authorized between a new player and a membership, three more copies of the initial agreement must be with the participant, the state relationship and the AIFF. Before, the golf clubs would have only the contract paperwork. Now, we wish those to send it to us within weekly. You want to suppress these age-old methods and have made a decision to execute these reforms," Das informed TOI on Sunday.